Americans eat up more than 16 billion jelly beans around Easter, and one group found that Michiganders will be chowing down mostly on the buttered popcorn flavor jelly beans. According to CandyStore.com , Michigan's favorite jelly bean flavor is Buttered Popcorn, which is also America's favorite flavor. Followed by Buttered Popcorn, Michigan's second favorite flavor is black licorice, followed by green apple. Last year, CandyStore.com says the state's favorite flavor was black licorice, but like the rest of the country, we flipped to buttered popcorn. To come up with this, they weighted sales and survey data at 90/10 respectively, with recent sales data in mind. 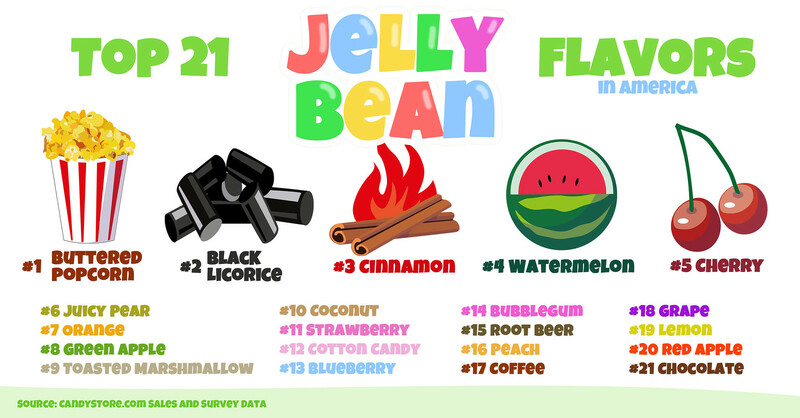 As for the rest of the nation, black licorice is the second most popular flavor, followed by cinnamon, watermelon and cherry. The least favorite flavor in America: Chocolate. Source: 10+ years online candy sales data from CandyStore.com .